A reminder that there will be NO SCHOOL FOR STUDENTS TOMORROW – FEBRUARY 16TH – as it is a District Professional Development Day for staff. 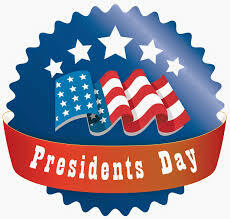 The district also will be closed – for both staff and students – THIS MONDAY, FEBRUARY 19TH in honor of Presidents Day. All school buildings will reopen Tuesday, February 20th. ANNUAL BATTLE OF THE SCHOOLS DODGEBALL TOURNAMENT IS TONIGHT! 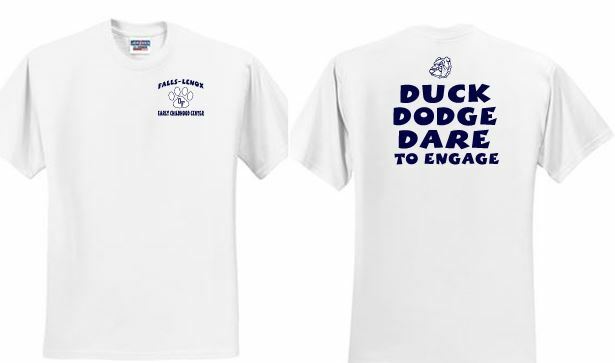 Get ready to duck, dodge and dare – to watch the annual Battle of the Schools Dodgeball Tournament TONIGHT – THURSDAY, FEBRUARY 15TH! The fun begins at 7 p.m. in the Olmsted Falls High School gym. Doors open at 6:30 for this PTA-sponsored event. Funds raised go toward scholarships for 2018 graduating seniors. Tickets are $4 for students and $6 for adults at the door. Don’t forget there is face painting, concessions, 50-50 raffle and a 3-point shooting fun that for $1 a shot, you can earn $2 for sinking it. The winning team of the battling schools then plays the champs of last week’s OFMS Dodgeball contest. Hope to see you there! 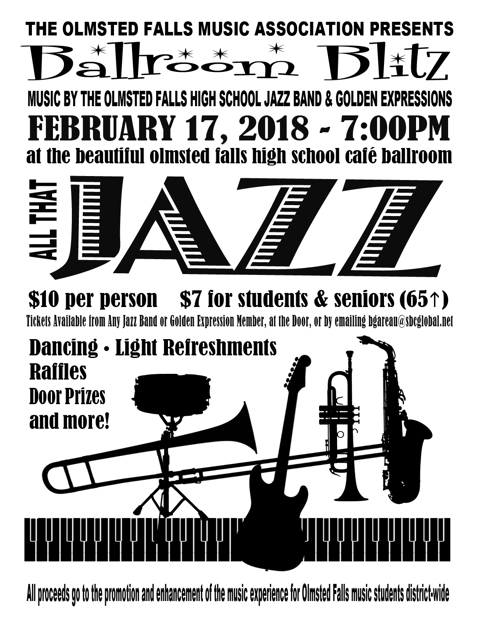 The Olmsted Falls Music Association’s Ballroom Blitz is this Saturday, February 17th in the OFHS cafe/ballroom. The school’s Jazz Band and Golden Expressions will perform with “All that Jazz” at 7 p.m. The night includes dancing, raffles, door prizes, light refreshments and more. The entry cost is $10 for adults and $7 for students and those over 65. Tickets are available from any jazz band/Golden Expressions member, at the door or by emailing bgareau@sbcglobal.net. It’s a night of fun and giving since all the proceeds go toward music enhancement within the district. Hope to see you there! Kudos and thanks OFHS junior Cole Zehe! Chromebook has an issue with the ribbon cable on the key pad – when the cable is bent over on itself, it loses connection. The OFCS tech department found an article revealing a solution to the problem by creating a 3D printed part. The tech staff approached Mr. Haydn’s Computer Integrated Manufacturing class to see if they might be able to create 3D parts as described in the article. Mr. Haydn gave the article to Cole Zehe and he made a model and printed samples for the tech staff to try. The first sample was not quite thick enough, so we increased the thickness and it works! We are so proud of our innovative, talented and problem-solving students! Well done! OFCS Superintendent Dr. Jim Lloyd continues to keep our community informed regarding broader issues in the field of education through his personally authored blog – the OFCS Superintendent’s Update. Dr. Lloyd’s most recent posts address this week’s press conference from the Ohio Statehouse announcing plans for a new legislation that would consolidate the Department of Education, Department of Higher Education and Governor’s Office of Workforce Transformation into one “super” department. Did You Know? You can sign-up to follow Dr. Lloyd’s blog and receive email notifications whenever he posts new content. Questions about Dr. Lloyd’s Superintendent’s Update blog and, as always, any questions about Olmsted Falls City School District can be directed to Dr. Lloyd at jlloyd@ofcs.net or by calling 440.427.6000. Thanks for staying informed about what’s happening in our schools and issues facing the broader field of public education. For those on Twitter, you can also follow Dr. Lloyd: @OFCSSuper. Congratulations to Haley Patel, graded 1; Mallory Alvarez, grade 2 and Mattea Amoah, grade 3. They are the Falls Lenox Primary School grade level winners in the recent Celebrating Differences Week poster contest. They are pictured here, from left to right, Haley, Mattea and Mallory. The major expansion and renovation underway at the high school is not the only construction project in town! Students in the Engineering Design & Development class at OFHS are working on “Can Structures,” fondly nicknamed “Canstruction” projects, these structures are built from food cans to a set of instructions. The students will be building the creative structures at Polaris Career Center next Friday, February 23rd. The timing corresponds to National Engineers Week – February 18th – 24th. All food cans they build these structures with will be donated to Christians in Action when disassembled. Students have been collecting donations from individuals and companies in order to purchase the specific cans of food needed to complete the structures. The budget is $1,941.27 and, to date, the group has received donations from Key Bank, Tower City, Duct Tape, Arconic/SkillsUSA Fund, Spoon Blossoms and other individuals. Anyone interested in giving a monetary donation to the project can drop off checks made out to Polaris Career Center with “Olmsted Falls Engineering” written on the note line. All monetary donations will be used for the structures and the remainder given to Christians in Action. Once the structures are built, the students are also planning an on-site donation box where visitors can leave additional non-perishable food donations. Bulldog students continue to inspire and amaze with the activities and projects they are involved in out in our community! CONGRATULATIONS TO WINNER OF THIS YEAR’S PTA TALENT SHOW! This year’s annual PTA Talent Show, held at the high school auditorium last month, marked the 31st anniversary for this beloved event which raises money annually for scholarships for graduating OFHS seniors. Congratulations to all of this year’s category winners (listed below) and many thanks to our amazing PTA volunteers for their time and effort in coordinating this fun event! There is no shortage of talent here in Bulldog Country! Congratulations again to all of these talented students! 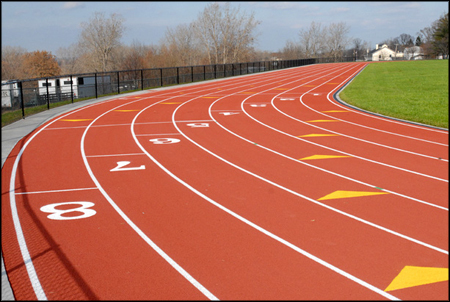 The Olmsted Falls High School track and field parent meeting is scheduled for 7 p.m. Wednesday, February 28th, in the high school choir room. High school students who plan to participate in track and field this spring should have their parents attend this important meeting. 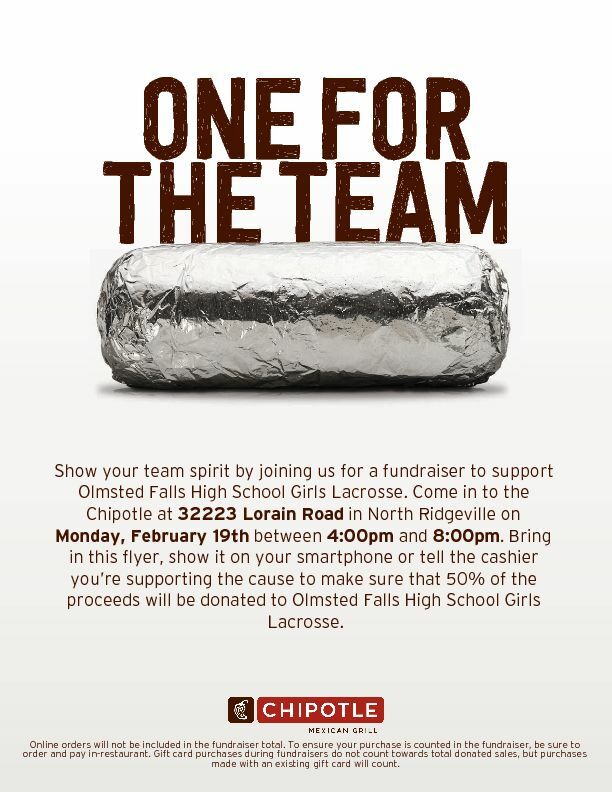 Help the OFHS Girls Lacrosse team by visiting the North Ridgeville’s Chipotle from 4-8 p.m. THIS MONDAY, February 19th. Show the attached flyer, either in hand or on our cell phone or simply tell the cashier you’re supporting the OFHS Girls Lacrosse fundraiser and the team will earn 50 percent of each order. The eatery is at 32223 Lorain Road, between Cook Road and I-480. Why not wrap yourself in a delicious burrito for dinner this Monday and support the team. Seller Registration Deadline is Friday, March 2nd. OR register as a seller online at: https://form.jotform.com/alicia07ou/bb-registration. $15/bowler which includes 2 games, shoes, slice of pizza, and a pop $6/non-bowler which includes a slice of pizza and a pop. Raffles, 50/50, and Bake Sale!!!! **Only 1 member of the team needs to register their team, preferably the captain. A confirmation email will be sent sharing payment options. Come join us for some bowling fun while supporting a good cause!!!! All funds raised by this event will be use to support OFCS Special Olympics athletes, award selected graduating seniors with scholarships, and provide grant opportunities for OFCS staff to purchase equipment/supplies for special needs students, field trip opportunities, and outside therapies (like music)!! Registration is now open through March 31th for the Olmsted Community Summer League. OCSL offers baseball and slow-pitch softball leagues/games for boys and girls ages 4 through 18. Kids for all skill levels are welcome. The league requires little to no travel. Register by February 28th to receive an early bird discount of $5 per player. To register, visit the Olmsted Community Center website at www.olmstedcc.com or in person at the OCC on Mapleway Drive. Registrations after March 31, 2018 will incur a $20 late fee and will only be accepted until April 15, 2018. Please like OCSL on Facebook for frequent updates and news about our league. Looking forward to seeing you on the ball fields. Any questions, please contact the OCC, (440) 427-1599. Olmsted Falls Lacrosse Association is excited to announce a new component to our developmental lacrosse program – Adaptive Lacrosse! This program will run during the standard lacrosse season (March – May) and is designed to allow individuals with developmental disabilities to learn about and participate in the game of lacrosse. If you or someone that you know is interested in learning more about this opportunity, please contact Jodi DeMarco at joannademarco@yahoo.com or 440-503-3090. All are welcome, this is not limited to Olmsted Falls. Congratulations to our Falls-Lenox/ECC PTA on being awarded a National PTA Take Your Family To School Week Grant sponsored by Chrysler and Google Chromebook. Our local PTA was one of just 55 PTA units across the country awarded this grant; and one of only four to be selected for it in the state of Ohio. Connecting school and home is a shared priority of both PTA and Olmsted Falls City Schools. Falls-Lenox/ECC PTA has come up with a unique and informative event to celebrate National PTA Take Your Family to School Week here in Olmsted Falls. WHEN: This Monday, February 12th 6:30-7:45 p.m.
WHAT: Falls-Lenox/ECC PTA has created a broadcast featuring a panel discussion containing useful information about different ways to support the success of your young students. All caregivers are invited to attend in person or make it a “virtual” event for yourself by tuning in to the special broadcast from any web connected computer or device. Those attending the event at Falls-Lenox will have access to ECC and Falls-Lenox building administrators following the broadcast screening for further Q & A. Refreshments will also be served. Babysitting will be available. Interested in viewing virtually from home (or wherever your schedule takes you this Monday evening)? Simply visit the ECC or Falls-Lenox building homepage on the district website Monday night and click on the “PTA Take Your Family to School Night” news item to access the video link. The link will also be promoted on various social media accounts including Falls-Lenox and ECC Twitter accounts and the FLECCPTA Facebook page. For additional information, click HERE to download an event flyer and parent letter. Congratulations to the 138 student performers from Olmsted Falls High School who attended and competed in the Greater Cleveland Solo and Ensemble Contest. Students prepared solo works as well as small group pieces that they played for a judge. They were then rated on their accomplishments. Students began practicing for the recent weekend event back in September. The results were OUTSTANDING. Olmsted Falls had the most students in attendance and the highest total scores. Our talents performers earned in total of 52 Perfect “Superior” ratings and 16 “Excellent” ratings. Olmsted Falls High School’s top brass quartet of Joe Bertrand, Dan Fidler, Catie Shambaugh, and Matt Strum played a 3 minute chamber piece that is extremely difficult. They not only earned a Superior rating, but were also recognized by the judge as being the BEST and most well prepared group she has ever adjudicated in all of her years. She instructed them to perform this piece again for as many people as would listen! Lots of great information on upcoming concerts and OFMA’s Ballroom Blitz! PTA sponsors an annual Battle of the Schools each year. All the money goes to high school scholarships. The Falls-Lenox/ECC Team is selling these cool shirts this year! Deadline To Order T-Shirts is TODAY Friday, February 9, 2018. The cost is $8 per shirt. Click school name and type in teacher name on-line when ordering. Questions? Please contact Mrs. Rivera at (440) 427-6470. The annual Battle of the Schools’ Dodgeball contest is at 7 p.m. February 15th at the OFHS gym. The doors open at 6:30 p.m. for this PTA-sponsored event whose funds go toward scholarships for 2018 graduating seniors. Tickets are $4 for students and $6 for adults at the door. 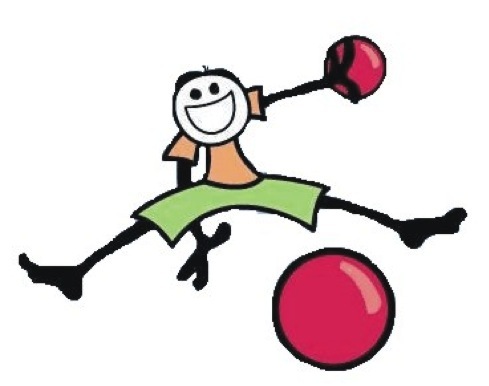 Cheer on the teams at Friday’s Olmsted Falls Middle School’s PTA Dodgeball Tournament. It will take place from 7-9 p.m. TONIGHT in the school’s gym. Why not check out the action and watch an exciting game right here in Olmsted Falls. Kindergartner Julian Husbands is the January Healthy Hero from ECC. The Healthy Hero program teaches students healthy habits, such as power hand washing, eating properly, daily exercise, sleeping well and coughing/sneezing in one’s sleeve. Each student recognized receives a Healthy Hero certificate and $5 gift card to an area store. Congratulations, Julian. Julian is pictured here with his mom Natalie and his teacher Mrs. Michaels. Students from OFHS business principles and marketing classes participated in the STEM Commercialization, Entrepreneurship & Innovation Forum held at Lorain County Community College on February 6th. At the forum, students had an opportunity to hear entrepreneurial faculty, researchers and practitioners talk about how their innovative ideas are shaping the future. 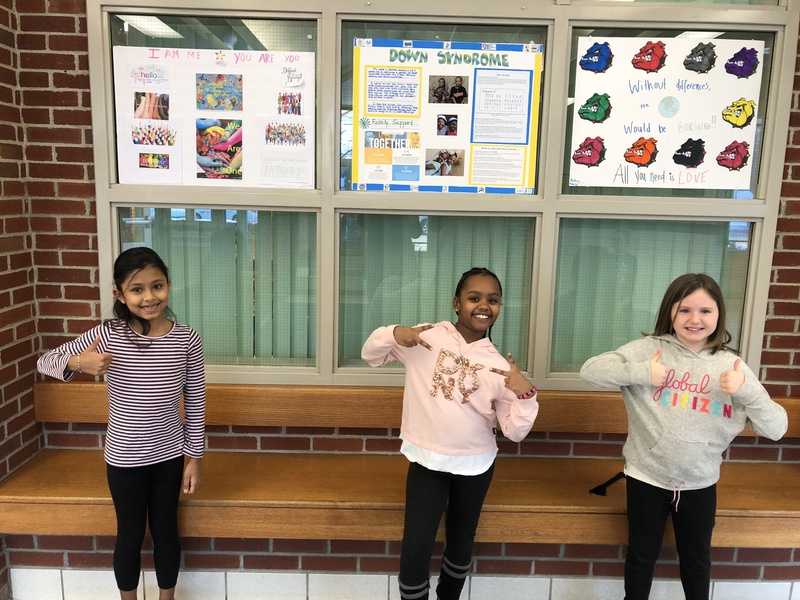 Students were then tasked to work in teams to develop a new product, service, or problem-solving innovation idea of their own that they then pitched “Shark Tank style” to their peers. Kudos to all of our OFHS innovators who participated in this valuable forum, and to their teachers Mrs. Cleary and Mrs. Kotz for their coordination! To view more photos from the STEM forum, please click HERE. The February edition of the OFHS newspaper, The Spotlight, is available online. 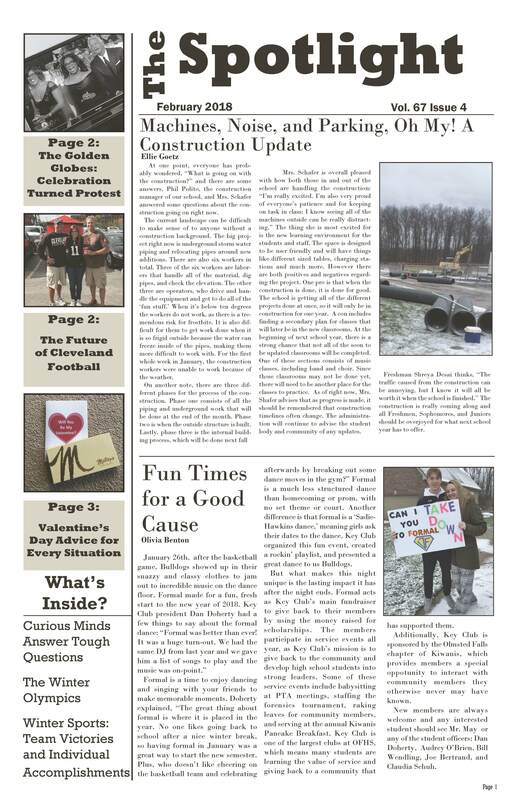 The newspaper features a construction project update, how some students view the work occurring at the school, the Key Club’s “formal” dance, a look at the Cleveland Browns’ future, a Valentine’s Day guide and other news. To view The Spotlight’s February edition, click HERE. This year’s Olmsted Falls Music Association’s Ballroom Blitz February 17 into the OFHS cafe/ballroom. The school’s Jazz Band and Golden Expressions will perform with “All that Jazz” at 7 p.m. The night includes dancing, raffles, door prizes, light refreshments and more. The entry cost is $10 for adults and $7 for students and those over 65. Tickets are available from any jazz band/Golden Expressions member, at the door or by emailing bgareau@sbcglobal.net. It’s a night of fun and giving since all the proceeds go toward music enhancement within the district. 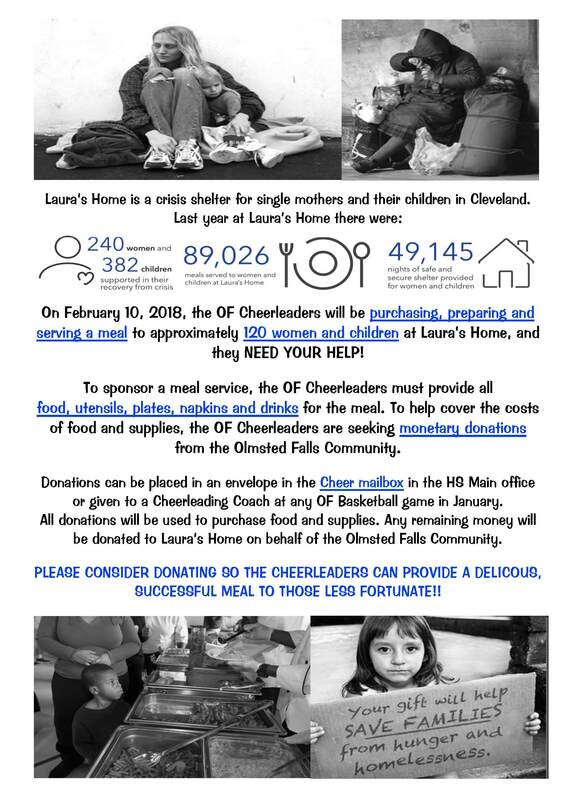 The OFHS cheerleaders TOMORROW – THIS SATURDAY – February 10th – will prepare and serve a meal for about 120 women and children at Laura’s Home. They are seeking monetary donations. Olmsted Falls High School, Attention: Cheer Program/Laura’s Home, 26939 Bagley Road, Olmsted Falls, OH 44138. All donations will be used to purchase food and supplies. Any remaining dollars will be donated to Laura’s Home on behalf of the Olmsted Falls community. Please consider donating so the cheerleaders may provide a delicious and successful meal to those less fortunate. This Saturday – February 10th – is the annual Alumni Las Vegas Night at the West Side Irish American Club. It runs from 7-11:30 p.m. at the club on Jennings Road. Attendees can win cash. The event is like a casino, but it’s closer to home – right here in Olmsted Township. 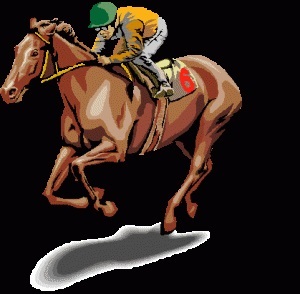 You can win cash playing blackjack, let it ride, dice, big wheel or poker. Even if you lose cash, it is winning because the money goes to scholarships for the OFHS Class of 2018. Win CAVS FLOOR SEATS and INDIANS TICKETS!! Once again, we will be raffling 2 sets of CAVS floor seats! For $10, you’ll have a 1 in 52 chance of winning a pair of floor seats to the 4/11 Cavs v Knicks game. Plus you can purchase a $5 playing card for a 1 in 52 chance of winning 4 front row bleacher tickets to the Indians! YOU could be one of our lucky winners! The event costs $6 at the door. All who are 21 and older are invited to attend. For more details, contact the Alumni Office, ofhsalumni@yahoo.com or 440-427-6030. Registration is now open through March 31, 2018 for the Olmsted Community Summer League. OCSL offers baseball and slow-pitch softball leagues/games for boys and girls ages 4 through 18. We accept kids of all skill levels and require little to no travel. To register, visit the Olmsted Community Center website at www.olmstedcc.com or in person at the OCC on Mapleway Drive. Registrations after March 31, 2018 will incur a $20 late fee and will only be accepted until April 15, 2018. Please like OCSL on Facebook for frequent updates and news about our league. We look forward to seeing you on the ball fields. Any questions please contact the OCC at (440) 427-1599.